“It has been our plan for long time to commission a training simulator for our Spitfire war birds here at Goodwood Aerodrome. It gives a good feeling to experience that the performance of the simulator is even better than we expected and we are confident that the simulator will be an invaluable tool during the training of future Spitfire pilots. It is also our intention to offer simulators flights to the public and to everybody that has an interest in preserving the finest British fighter plane every built. “I would also like to express a grateful thanks to everybody that have participated in this successful project, in particular the volunteers at the Tangmere Military & Aviation Museum Trust”. In order to give pilots a realistic sensation of flying, Boultbee Flight Academy wanted to create a simulator with a realistic aerodynamic model of the Spitfire Mk IX. This would use a real Spitfire MkIX fuselage with authentic gauges, controls and instruments. 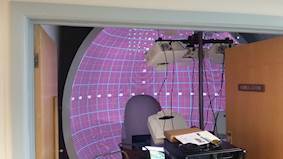 It would need high resolution imagery projected onto a spherical dome screen to simulate what a pilot would see and experience when flying this fighter plane. Boultbee Flight Academy, at Goodwood Aerodrome in Chichester, is the world's first Spitfire training school since the iconic fighter plane was taken out of operational service in 1955. In addition to the school activities, the academy also offers the public real flying experiences in various old warbirds. The team, led by Boultbee Flight Academy, includes Airtech Simulation Ltd for overall simulator design, modifications of gauges, controls and instruments and preparation of the Spitfire fuselage and simulation software; Warpalizer Norway AS for the optical design of the projection systems including the Warpalizer warp and blend software; Fibresports Ltd for the spherical dome screen and Optoma for the projectors. The simulator was installed in a 3.4 x 4 x 2.9m (WxDxH) room adjacent to the pilots’ briefing room. 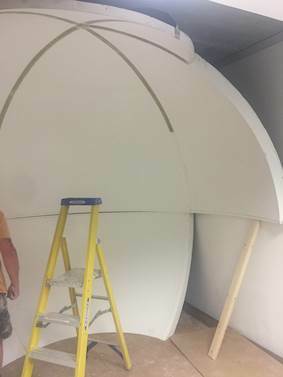 The 3.2 m radius spherical dome screen needed to be manufactured in bespoke segments to allow installation with minimum clearance in the height and width domains. Seven Optoma W505 projectors with short throw 0.8:1 lenses were positioned and oriented so the images covered the spherical screen completely and, also very importantly, such that the Spitfire Mk IX fuselage, with its canopy closed, does not created any shadows on the screen. To ensure a totally seamless and geometrically correct visual system, the super-efficient Warpalizer software was integrated integrated with Prepar3D v4 simulation platform. Further enhancement of visual quality was achieved by running the 5,000-lumen Optoma W505 projectors in Eco mode, thereby also extending the life time of the lamps. 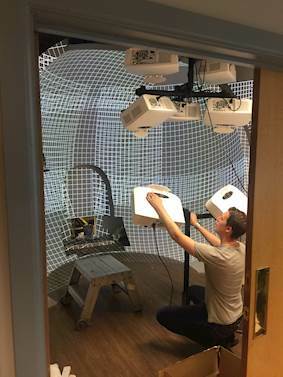 The 3D scenery projected includes a geo-specific model of the Goodwood area and surroundings, allowing the simulator training to resemble real flights as much as possible. The fuselage used is a section of a real Spitfire Mk IX. All of the controls, gauges and instruments are real but modified for realistic in-flight behaviour. 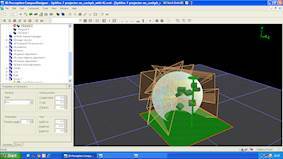 The modifications include interfaces to the Prepar3D software. The Spitfire Mk9 aerodynamic model, being a part of the Prepar3D, has been augmented by Spitfire pilots to ensure the most realistic experience possible. The new Spitfire simulator at Boultbee Flight Academy’s main facility at Goodwood Aerodrome is the most true-to-life Spitfire flight simulator ever built. 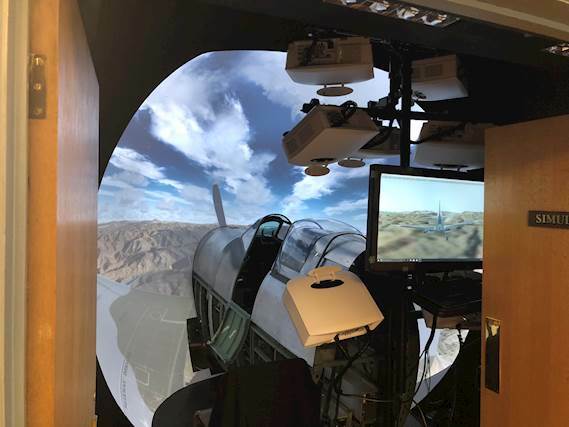 The academy’s portfolio of products has now been augmented by the simulator which, in addition to being used for training pilots, also offers the public a sensation of how it would feel to fly this majestic fighter plane. 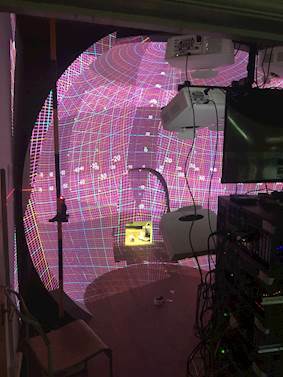 Thanks to its compact design, the simulator offers a horizontal field of view of 225° and a vertical field of view from -55° and to 110° (20° beyond north). The field of views offered by the projection system gives the pilot 100% coverage of the areas visible from his eye-point with the cockpit closed. Matt Jones, MD & Chief Pilot at Boultbee Flight Academy, said: “It has been our plan for long time to commission a training simulator for our Spitfire war birds here at Goodwood Aerodrome. 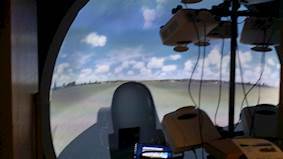 It gives a good feeling to experience that the performance of the simulator is even better than we expected and we are confident that the simulator will be an invaluable tool during the training of future Spitfire pilots. It is also our intention to offer simulators flights to the public and to everybody that has an interest in preserving the finest British fighter plane every built. “I would also like to express a grateful thanks to everybody that have participated in this successful project, in particular the volunteers at the Tangmere Military & Aviation Museum Trust”. Olav Sandnes from Warpalizer Norway AS, said: “We congratulate Boultbee Flight Academy on its new and novel Spitfire Mk IX Simulator and are proud that we were selected to be part of the team. To make the best simulator in the world is not a very big challenge, but to make a simulator that looks, feels and operates like a second to none simulator inside a 20% normal budget, is certainly an achievement. The success is based on an open and solution-oriented team with co-operation and willingness to challenge truths. Also thanks to Fibresports and Optoma for their willingness to think outside the box. The aim of Boultbee Flight Academy is to keep Spitfire’s in the air and open the doors of the Spitfire world to the public. The academy offers Spitfire experience flights and experience flights to non-pilots and Spitfire training to pilots. A flight in a Spitfire is an incredible experience for pilots and laypeople alike. Spitfire MK IX fuselage, bespoke dome screen, seven computers, seven Optoma W505 projectors, Prepar3D v4 flight simulator application, Warpalizer warp and blend software and bespoke projector mountings.